This entry was posted on Monday, April 20th, 2009 at 09:56 and is filed under Uncategorized. You can follow any responses to this entry through the RSS 2.0 feed. You can leave a response, or trackback from your own site. Seem to be having some DNS issues with the primary domain name…please use http://www.lpforensics.com until I get it sorted out. Hope you guys enjoy the site. If there is anything you would like to see added to the site, or any comments/criticism, please contact me (details on site) or post it here. datagram, have you considered putting up a small “database” of pictures/explanation of broken/forced locks? Would be very nice to have realworld situation photos of locks and examination of the marks and conclusion of method used to break the lock. I have two or three locks that have been forced open in some way and they have prettu nice tool marks and one of the locks (Abloy PL3020) shows a very characteristic method of opening it by force. Both URLs are working now, my apologies. Use whichever you find easier to remember or type. I would be glad if you could send me your images, or upload them to LockWiki.com under whichever license you want. 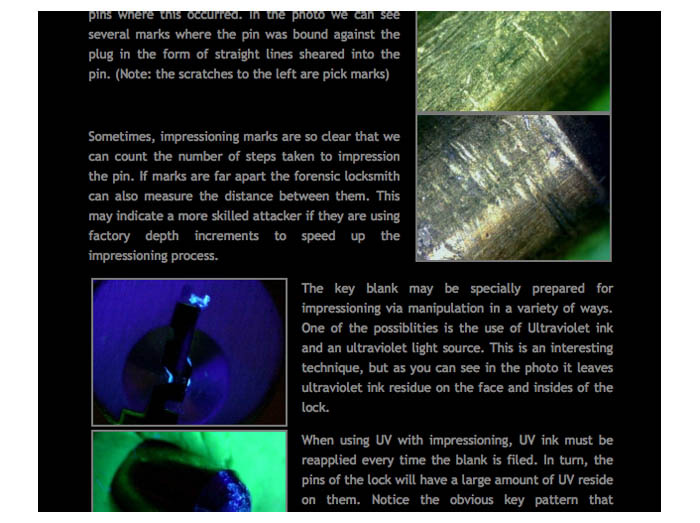 The only problem with sending me images of locks is that I can’t get too in depth and do laboratory investigations, tool mark comparisons, or anything else that might be of that nature and good for the site. Regardless, I would be happy to have the content, as I don’t have the funds to do some of the more advanced forced entry against expensive locks. In related news, I will be doing the destructive entry section of the website this weekend. Anyone have suggestions as to what should be includeed? « So you think you know your keys?!? Entries (RSS) and Comments (RSS). 49 queries. 0.382 seconds.